Thanksgiving Dinner on the Beach! - Yo! Venice! Home Venice Beach California Thanksgiving Dinner on the Beach! Thanksgiving Dinner on the Beach! Thanksgiving Day is expected to be sunny and 70 degrees! Looking for an economical, tasty and fun way to spend the day? 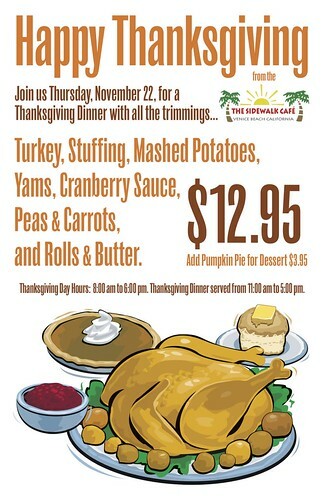 The Sidewalk Cafe will be serving Thanksgiving Dinner “with all the trimmings” for $12.95! The Cafe will be open from 8am-6pm and serving Thanksgiving Dinner from 11am-5pm! Sit outside, fill up with food and drink and watch Venice roll by!